We brought some of our lucky readers on a trip to three of the venues in Dublin. A REVOLUTIONARY RISING, a not-so-secret society and a juggler - that’s what 50 of our readers got to experience when we took them on a sneak preview tour of Culture Night 2016. 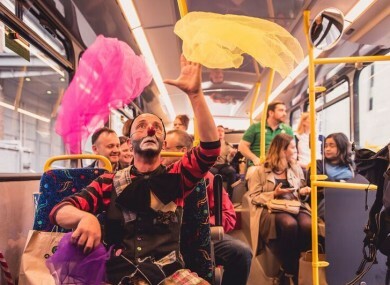 The night itself takes place on Friday 16 September, but the lucky winners of our TheJournal.ie Culture Night Dublin Bus preview tour got to see three of the locations that will be open to all on the night. They got to look around the Freemason’s Hall, the GPO Witness History exhibition (which is dedicated to the 1916 Rising), and the lovely Copper House Gallery artspace. See how they got on by taking a peek at the video above. To find out more about Culture Night, visit the official website. Email “WATCH: Here's a sneak peek of Culture Night 2016 ”. Feedback on “WATCH: Here's a sneak peek of Culture Night 2016 ”.